Before you start into this one, friends, but one keen word of advice: Read Carefully. And In Full. For the Catholic communities of Boston, New York, Philadelphia and Louisville, this is a year of particular celebration, as it marks the bicentenary of the establishment of these local Churches as Dioceses. I join you in giving thanks for the many graces granted to the Church there during these two centuries. As this year also marks the bicentenary of the elevation of the founding see of Baltimore to an Archdiocese, it gives me an opportunity to recall with admiration and gratitude the life and ministry of John Carroll, the first Bishop of Baltimore - a worthy leader of the Catholic community in your newly independent nation. His tireless efforts to spread the Gospel in the vast territory under his care laid the foundations for the ecclesial life of your country and enabled the Church in America to grow to maturity. Today the Catholic community you serve is one of the largest in the world, and one of the most influential. How important it is, then, to let your light so shine before your fellow citizens and before the world, "that they may see your good works and give glory to your Father who is in heaven" (Mt 5:16). Many of the people to whom John Carroll and his fellow Bishops were ministering two centuries ago had travelled from distant lands. The diversity of their origins is reflected in the rich variety of ecclesial life in present-day America. Brother Bishops, I want to encourage you and your communities to continue to welcome the immigrants who join your ranks today, to share their joys and hopes, to support them in their sorrows and trials, and to help them flourish in their new home. This, indeed, is what your fellow countrymen have done for generations. From the beginning, they have opened their doors to the tired, the poor, the "huddled masses yearning to breathe free" (cf. Sonnet inscribed on the Statue of Liberty). These are the people whom America has made her own. America is also a land of great faith. Your people are remarkable for their religious fervor and they take pride in belonging to a worshipping community. They have confidence in God, and they do not hesitate to bring moral arguments rooted in biblical faith into their public discourse. Respect for freedom of religion is deeply ingrained in the American consciousness - a fact which has contributed to this country's attraction for generations of immigrants, seeking a home where they can worship freely in accordance with their beliefs. In this connection, I happily acknowledge the presence among you of Bishops from all the venerable Eastern Churches in communion with the Successor of Peter, whom I greet with special joy. Dear Brothers, I ask you to assure your communities of my deep affection and my continued prayers, both for them and for the many brothers and sisters who remain in their land of origin. Your presence here is a reminder of the courageous witness to Christ of so many members of your communities, often amid suffering, in their respective homelands. It is also a great enrichment of the ecclesial life of America, giving vivid expression to the Church's catholicity and the variety of her liturgical and spiritual traditions. It is in this fertile soil, nourished from so many different sources, that all of you, Brother Bishops, are called to sow the seeds of the Gospel today. This leads me to ask how, in the twenty-first century, a bishop can best fulfill the call to "make all things new in Christ, our hope"? How can he lead his people to "an encounter with the living God", the source of that life-transforming hope of which the Gospel speaks (cf. Spe Salvi, 4)? Perhaps he needs to begin by clearing away some of the barriers to such an encounter. While it is true that this country is marked by a genuinely religious spirit, the subtle influence of secularism can nevertheless color the way people allow their faith to influence their behavior. Is it consistent to profess our beliefs in church on Sunday, and then during the week to promote business practices or medical procedures contrary to those beliefs? Is it consistent for practicing Catholics to ignore or exploit the poor and the marginalized, to promote sexual behavior contrary to Catholic moral teaching, or to adopt positions that contradict the right to life of every human being from conception to natural death? Any tendency to treat religion as a private matter must be resisted. Only when their faith permeates every aspect of their lives do Christians become truly open to the transforming power of the Gospel. For an affluent society, a further obstacle to an encounter with the living God lies in the subtle influence of materialism, which can all too easily focus the attention on the hundredfold, which God promises now in this time, at the expense of the eternal life which he promises in the age to come (cf. Mk 10:30). People today need to be reminded of the ultimate purpose of their lives. They need to recognize that implanted within them is a deep thirst for God. They need to be given opportunities to drink from the wells of his infinite love. It is easy to be entranced by the almost unlimited possibilities that science and technology place before us; it is easy to make the mistake of thinking we can obtain by our own efforts the fulfillment of our deepest needs. This is an illusion. Without God, who alone bestows upon us what we by ourselves cannot attain (cf. Spe Salvi, 31), our lives are ultimately empty. People need to be constantly reminded to cultivate a relationship with him who came that we might have life in abundance (cf. Jn 10:10). The goal of all our pastoral and catechetical work, the object of our preaching, and the focus of our sacramental ministry should be to help people establish and nurture that living relationship with "Christ Jesus, our hope" (1 Tim 1:1). In a society which values personal freedom and autonomy, it is easy to lose sight of our dependence on others as well as the responsibilities that we bear towards them. This emphasis on individualism has even affected the Church (cf. Spe Salvi, 13-15), giving rise to a form of piety which sometimes emphasizes our private relationship with God at the expense of our calling to be members of a redeemed community. Yet from the beginning, God saw that "it is not good for man to be alone" (Gen 2:18). We were created as social beings who find fulfillment only in love - for God and for our neighbor. If we are truly to gaze upon him who is the source of our joy, we need to do so as members of the people of God (cf. Spe Salvi, 14). If this seems counter-cultural, that is simply further evidence of the urgent need for a renewed evangelization of culture. Here in America, you are blessed with a Catholic laity of considerable cultural diversity, who place their wide-ranging gifts at the service of the Church and of society at large. They look to you to offer them encouragement, leadership and direction. In an age that is saturated with information, the importance of providing sound formation in the faith cannot be overstated. American Catholics have traditionally placed a high value on religious education, both in schools and in the context of adult formation programs. These need to be maintained and expanded. The many generous men and women who devote themselves to charitable activity need to be helped to renew their dedication through a "formation of the heart": an "encounter with God in Christ which awakens their love and opens their spirits to others" (Deus Caritas Est, 31). At a time when advances in medical science bring new hope to many, they also give rise to previously unimagined ethical challenges. This makes it more important than ever to offer thorough formation in the Church's moral teaching to Catholics engaged in health care. Wise guidance is needed in all these apostolates, so that they may bear abundant fruit; if they are truly to promote the integral good of the human person, they too need to be made new in Christ our hope. Clearly, the Church's influence on public debate takes place on many different levels. In the United States, as elsewhere, there is much current and proposed legislation that gives cause for concern from the point of view of morality, and the Catholic community, under your guidance, needs to offer a clear and united witness on such matters. Even more important, though, is the gradual opening of the minds and hearts of the wider community to moral truth. Here much remains to be done. Crucial in this regard is the role of the lay faithful to act as a "leaven" in society. Yet it cannot be assumed that all Catholic citizens think in harmony with the Church's teaching on today's key ethical questions. Once again, it falls to you to ensure that the moral formation provided at every level of ecclesial life reflects the authentic teaching of the Gospel of life. In this regard, a matter of deep concern to us all is the state of the family within society. Indeed, Cardinal George mentioned earlier that you have included the strengthening of marriage and family life among the priorities for your attention over the next few years. In this year's World Day of Peace Message I spoke of the essential contribution that healthy family life makes to peace within and between nations. In the family home we experience "some of the fundamental elements of peace: justice and love between brothers and sisters, the role of authority expressed by parents, loving concern for the members who are weaker because of youth, sickness or old age, mutual help in the necessities of life, readiness to accept others and, if necessary, to forgive them" (no. 3). The family is also the primary place for evangelization, for passing on the faith, for helping young people to appreciate the importance of religious practice and Sunday observance. How can we not be dismayed as we observe the sharp decline of the family as a basic element of Church and society? Divorce and infidelity have increased, and many young men and women are choosing to postpone marriage or to forego it altogether. To some young Catholics, the sacramental bond of marriage seems scarcely distinguishable from a civil bond, or even a purely informal and open-ended arrangement to live with another person. Hence we have an alarming decrease in the number of Catholic marriages in the United States together with an increase in cohabitation, in which the Christ-like mutual self-giving of spouses, sealed by a public promise to live out the demands of an indissoluble lifelong commitment, is simply absent. In such circumstances, children are denied the secure environment that they need in order truly to flourish as human beings, and society is denied the stable building blocks which it requires if the cohesion and moral focus of the community are to be maintained. As my predecessor, Pope John Paul II taught, "The person principally responsible in the Diocese for the pastoral care of the family is the Bishop ... he must devote to it personal interest, care, time, personnel and resources, but above all personal support for the families and for all those who … assist him in the pastoral care of the family" (Familiaris Consortio, 73). It is your task to proclaim boldly the arguments from faith and reason in favor of the institution of marriage, understood as a lifelong commitment between a man and a woman, open to the transmission of life. This message should resonate with people today, because it is essentially an unconditional and unreserved "yes" to life, a "yes" to love, and a "yes" to the aspirations at the heart of our common humanity, as we strive to fulfill our deep yearning for intimacy with others and with the Lord. Among the countersigns to the Gospel of life found in America and elsewhere is one that causes deep shame: the sexual abuse of minors. Many of you have spoken to me of the enormous pain that your communities have suffered when clerics have betrayed their priestly obligations and duties by such gravely immoral behavior. As you strive to eliminate this evil wherever it occurs, you may be assured of the prayerful support of God's people throughout the world. Rightly, you attach priority to showing compassion and care to the victims. It is your God-given responsibility as pastors to bind up the wounds caused by every breach of trust, to foster healing, to promote reconciliation and to reach out with loving concern to those so seriously wronged. Priests, too, need your guidance and closeness during this difficult time. They have experienced shame over what has occurred, and there are those who feel they have lost some of the trust and esteem they once enjoyed. Not a few are experiencing a closeness to Christ in his Passion as they struggle to come to terms with the consequences of the crisis. The Bishop, as father, brother and friend of his priests, can help them to draw spiritual fruit from this union with Christ by making them aware of the Lord's consoling presence in the midst of their suffering, and by encouraging them to walk with the Lord along the path of hope (cf. Spe Salvi, 39). 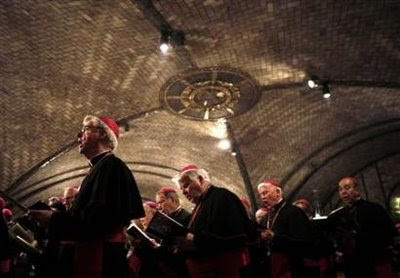 As Pope John Paul II observed six years ago, "we must be confident that this time of trial will bring a purification of the entire Catholic community", leading to "a holier priesthood, a holier episcopate and a holier Church" (Address to the Cardinals of the United States, 23 April 2002, 4). There are many signs that, during the intervening period, such purification has indeed been taking place. Christ's abiding presence in the midst of our suffering is gradually transforming our darkness into light: all things are indeed being made new in Christ Jesus our hope. Time spent in prayer is never wasted, however urgent the duties that press upon us from every side. Adoration of Christ our Lord in the Blessed Sacrament prolongs and intensifies the union with him that is established through the Eucharistic celebration (cf. Sacramentum Caritatis, 66). Contemplation of the mysteries of the Rosary releases all their saving power and it conforms, unites and consecrates us to Jesus Christ (cf. Rosarium Virginis Mariae, 11, 15). Fidelity to the Liturgy of the Hours ensures that the whole of our day is sanctified and it continually reminds us of the need to remain focused on doing God's work, however many pressures and distractions may arise from the task at hand. Thus our devotion helps us to speak and act in persona Christi, to teach, govern and sanctify the faithful in the name of Jesus, to bring his reconciliation, his healing and his love to all his beloved brothers and sisters. This radical configuration to Christ, the Good Shepherd, lies at the heart of our pastoral ministry, and if we open ourselves through prayer to the power of the Spirit, he will give us the gifts we need to carry out our daunting task, so that we need never "be anxious how to speak or what to say" (Mt 10:19). As I conclude my words to you this evening, I commend the Church in your country most particularly to the maternal care and intercession of Mary Immaculate, Patroness of the United States. May she who carried within her womb the hope of all the nations intercede for the people of this country, so that all may be made new in Jesus Christ her Son. My dear Brother Bishops, I assure each of you here present of my deep friendship and my participation in your pastoral concerns. To all of you, and to your clergy, religious and lay faithful, I cordially impart my Apostolic Blessing as a pledge of joy and peace in the Risen Lord. Thank you!